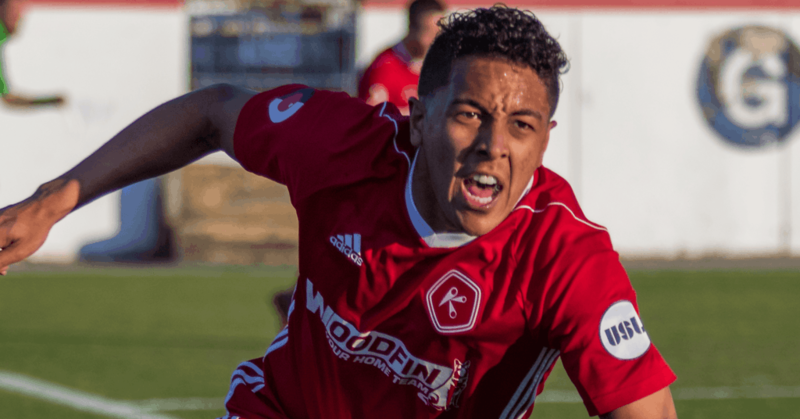 RICHMOND, VA — (Saturday, March 31, 2018) — The Richmond Kickers (1-2-0) picked up their first victory of the 2018 season Saturday night at City Stadium over North Carolina FC (0-2-0). NCFC took the lead in the 43rd minute. Yudai Imura leveled the score for Richmond in the 77th minute from the penalty spot. Brian Shriver set up Raul Gonzalez in the 83rd minute to seal the win for the Kickers over their new regional rivals. The Kickers went offensive early in the 10th minute through Brian Shriver. Koby Osei-Wusu received the ball from Matt Bolduc. He quickly turned and fed the ball through to Shriver on the left side of the field. Shriver took a touch to get enough space as his shot ended up sailing wide of the NCFC goal. Travis Worra was called into action in the 12th minute after Austin da Luz had the first chance on goal for the visitors. D.J. Taylor played a cross in from the right side near the end line to connect with Kyle Bekker at the top of the Richmond box as he knocked it down to Stephen Miller. Miller dummied the ball past Bekker and through to da Luz. He went for a low shot as Worra smothered it. The best chance for Richmond came from Koby Osei-Wusu in the 33rd minute. Bolduc won the ball in the midfield on the far right side. He started to make his run forward as Osei-Wusu broke free from his defender. Bolduc slotted the ball through to Osei-Wusu. The rookie looked for the near post as Tambakis stretched to make the save. North Carolina would take the lead in the 43rd minute behind a goal from Daniel Rios. Austin da Luz picked up control of the ball on the right side and quickly turned up field and fed the ball up for Stephen Miller near the end line. Miller cut back and found Rios right at the top of the six-yard box. He went up over Worra and into the crossbar and down for the opening goal. The Kickers drew level in the 77th minute from the penalty spot. Scott Thomsen chipped the ball over the top for Brian Shriver as he was entering the NCFC box. D.J. Taylor came to try and prevent the shot and took down Shriver, drawing the penalty for Richmond. Yudai Imura stepped up and converted the penalty. Austin da Luz nearly gave NCFC the lead again in the 81st minute as Travis Worra came up big for Richmond. Miller laid the ball back for Donovan Ewolo at the top of the Kickers 18-yard box. Ewolo played a cross into the box and found da Luz for a header towards the top left corner. Worra was able to get a hand to the ball and tipped it over the goal. Richmond would finally take the lead in the 83rd minute from second half substitute Raul Gonzalez. Oscar Umar launched a low pass up the field and found Gonzalez. He took a slight touch to get it to the feet of Brian Shriver as he turned around his defender. Shriver sent the ball back in front of goal as Gonzalez met the cross with a back heel to get the game winning goal. North Carolina FC came close to getting the draw in stoppage time from Marios Lomis. Graham Smith controlled the ball and quickly chipped it over the top for Lomis as he made a run towards goal. He fought off William Yomby to get a shot on target as Worra came off his line to make a massive save to preserve the win for Richmond. The Kickers return to City Stadium next Saturday night as New York Red Bulls II come to town for a 5:00 p.m. kickoff. The party starts at 3:00 p.m. with the I Heart Carytown Craft beer festival with live music by Pretty Ugly, a mini-Carytown marketplace featuring locally-owned restaurants, food trucks and handcrafted items from Carytown boutiques, 20+ craft beers on tap. Tickets are on sale now at RichmondKickers.com.